Happy New Year and you'll be pleased to note I have been busy over the holidays. i didn't get many 'toys' aside from the accompanying resin bases but as I did have the Deathstorm boxset I was kept more than occupied and this should at least provide some content over the next few weeks, which I confess has recently been lacking. Unfortunately I'd intended for this to be posted between Christmas and New Year but forgot to add the text to the pictures [and any other pending post for that matter] so I'm behind schedule. That's good news though because it means I should have half a dozen updates to share. Although I was hoping for this post about nothing more than a few bases to be lost in the Christmas reveries instead of heralding my triumphant return, c'est la vie. For Christmas I asked for a number of Dark Art Miniature's resin bases they're for a number of things. This first one is for Project Z, yes I know it's not been revealed yet, but I'll get to it eventually. 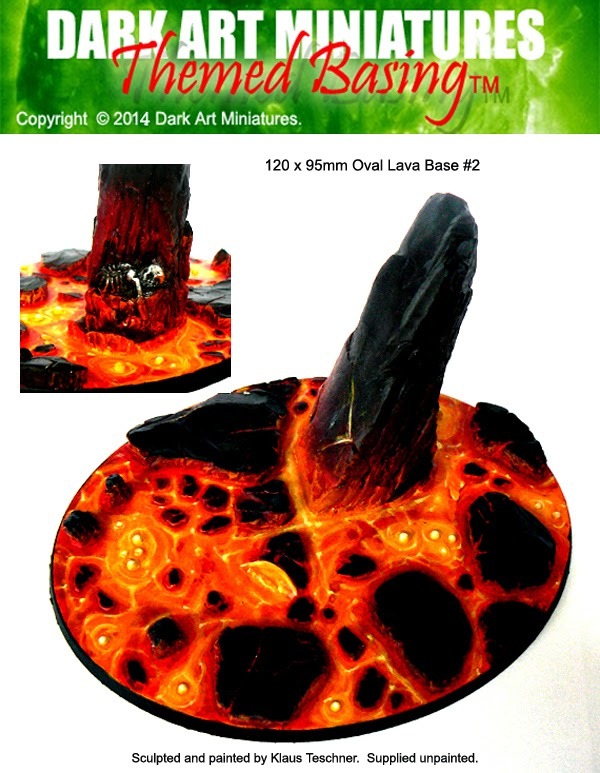 Both my brother and friend Pete [not to be confused with PeteB] got me this lava themed base, which is handy as I have the potential to muck it up and having a spare will be useful. It won't be lava though, I'm hoping to make it look like the red rocks of Ferron Proxima bursting through the slurry of a Tyranid reclamation/digestion pit, which should be cool. My brother also got me a couple of the 40mm Urban hero bases. I'd been after one of these for my Deathleaper model for Blog Wars but hadn't got it [or Deathleaper for that matter]. Now I can mount the model and have a spare for a Dark Angel character. As you can see it's a really cool base, it come in two part so you can paint the rubble underneath. The original plan was to paint the flag as the Blog Wars logo shamelessly trying to secure the best painted Character vote ;) The irony is I think Deathleaper may have had his last chance at BW8 so whether I get to run him next time is in the balance. 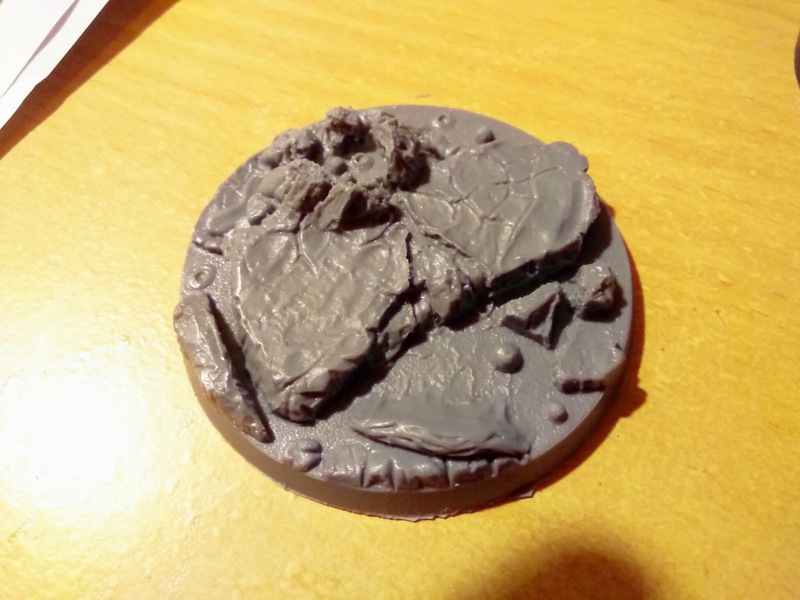 And my brother also picked up a 60mm lava base, now I didn't ask for this but it was certainly welcome. 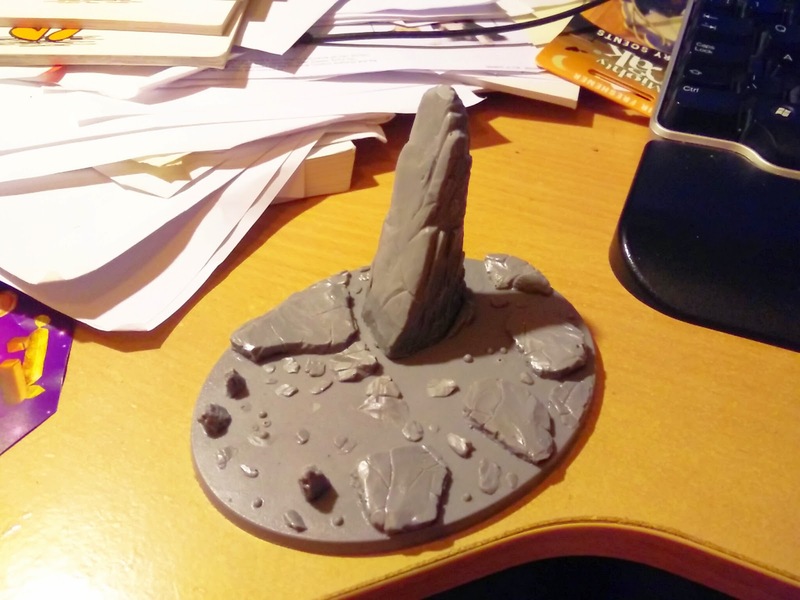 This will form the base for my Deathstorm - Beast of Phodia Carnifex. I'm not about to entertain this new oval base but I recognise the opportunity to make it stand out. I will of course be magnetising the 'beast', I've learned the easy way [and therefore the best way] that magnetising a Carnifex is the only way to go. So I will be able to run him as the Beast of Phodia, or a dakkafex or any other variety should I so choose. That's it but there'll be some actual hobby progress to follow soon. The Spawn of Cryptus has been painted and just yesterday I finished construction of my 20 new Genestealers and will be kitbashing some of the original Space Hulk Stealers to have scything talons and perhaps more dynamic. Of course none of those are on my To Do List but that's par for the course. The bases look cool mate & may I ask will you be doing some kind of DA banner on the flag ? I know, the To Do list is a forgotten soul at the moment, but I think that's only natural as the new year rolls out there will be hobby momentum to follow. It may well be a Dark Angel banner, but I may still do a Blog Wars one and then repaint it. The spare [for a DA champion/hero] might be a Free Radical Collective banner. Though magnetizing drives me nuts sometimes, it is so worth it in the end. I am already happy I magnetized the stompa. So much room for activities! 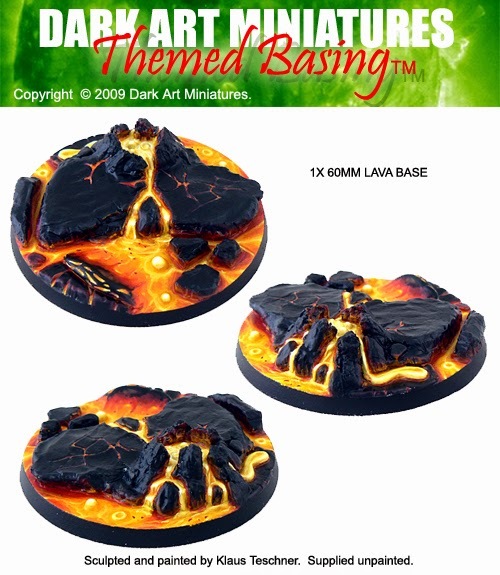 Looking forward to the lava bases. you know how I love bases! Happy new year! All the best t youu too Greg. My supply of Megnetix magnets is the best purchase I never made. Unfortuantely I've misplaced by supply of tiny 2x1mm magnets which would have helped with things like Stranglethorn Cannon feed tubes. Still I've just magnetised the head for my first Carnifex, his head was previously only being held in by the little tab. So I thought it time to mag up. Lots of fun in store for 2015, not sure it'll be as monumental as my Skyshield for 2014 but there are some stand out projects and models still to come. Is that your fav brand? I went through a couple different types, and some of them have been quite weaker (for the same size) then others. 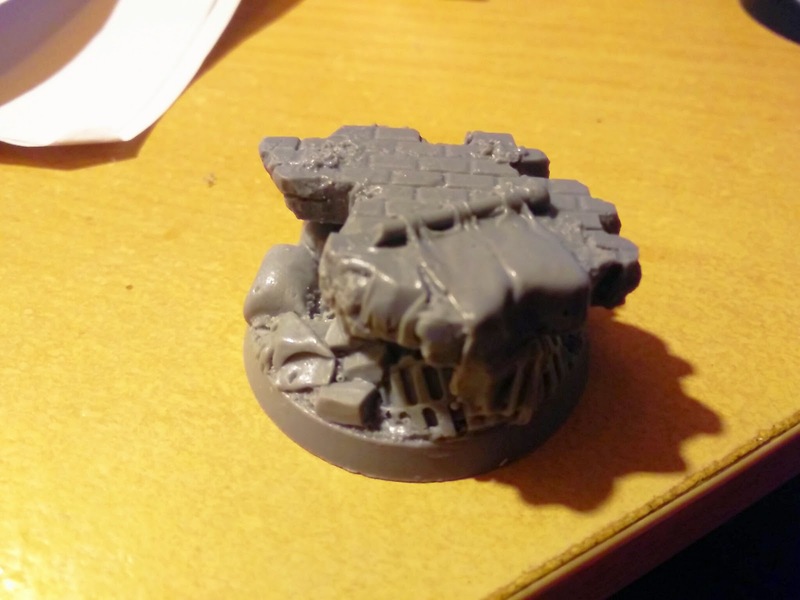 I think my stompa is at 40 magnets because I used too small ones. Should have used much larger discs...lessons learned! We got loads of Magnetix for my son when he was much younger. For some reason I kept them, I never realised they'd been recalled because the design allowed some children to dislodge the magnets and swallow them. It's got a couple of sizes and they're really quite strong. From what I gather they come with an 'n' rating. I've no idea what mine are but when you look on ebay you'll see n52 or n40, I think the higher they are the stronger. For the Carnifex I've got the 6mm ones for arm sockets, then the tiny Mawloc talons will have the 4.5mm ones. They do the job, cost me nothing and I'm 're-using' which is actually 'green'. Happy new year to you aswell Dave. All the best Jamie, they have quite a line of stuff, obviously the alien walls are really interesting. One of those items you see regularly and forget who makes it then you order somehting and go 'oh yeah'. And they're local too, to me anyway, only 30 miles away. The To Do List is a guide really, just to help focus. If you look at my review of last years Hobby Season [August 28th] you’ll see I deviated wildly from what was planned. I always try to go with the flow. It’s better to let your mojo keep your motivation flowing, although occasionally I think you can throw in a few onerous tasks and trust that mojo will help crest some of the difficult waves. However, it’s nice to have a list you can tick things off and this year there’s quite a few of us seeing what we can to complete that list. I found myself a little demoralised by not achieving "to do lists", so I distinguish now between "to do lists", which is stuff that _needs_ to get done (mostly Real Life stuff rather than hobby, unless I have a tournament or event to get painted for) and aspirational stuff without a deadline which I'll still feel good about completing without feeling down if I haven't done it. I looked at a painting points system but thoguht it was time consuming. I've had a list since of things to do for the last few years. I probably approach it in the same way as you, it's just a loose reminder of things that really need to get done and help me focus when I'm not otherwise engaged. So long as I'm doing something it's not a problem if it's not on the list. This year I opened it up to readers to join me and they took from it what they wanted, with big lists, small lists, lists that were to be followed strictly and those that were just guides. The important thing being that come the end of August when the hobby Season closes we can look back on what was achieved and celebrate, as well as celebrating each acheivement [whether on or off the list] as and when it happens. That's where the Red Stamp of Approval comes in. If it was a process that ended up demoralising the hobby for me I wouldn't be doing it. 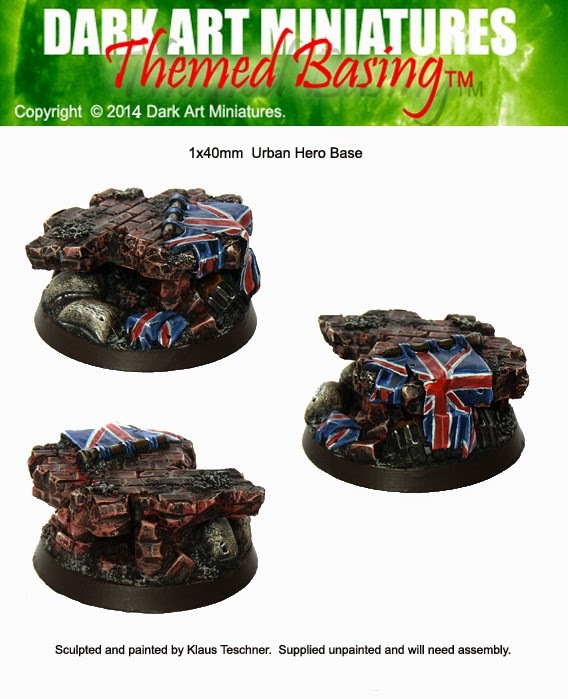 That Union Jack base looks like it should have Eddie from Iron Maiden standing over it ;-) I am looking forward to seeing your Spawn of Cryptus, I nearly bought the box just to get hold of one. My long suffering Broodlord is a mash up between a 3rd Ed. Lictor and a 2nd Ed. Tyrant. Ugly... but he has stolen sooo many genes. Happy New Year! I'm sure when the Spawn is on the table my enemies will 'run to the hills'!